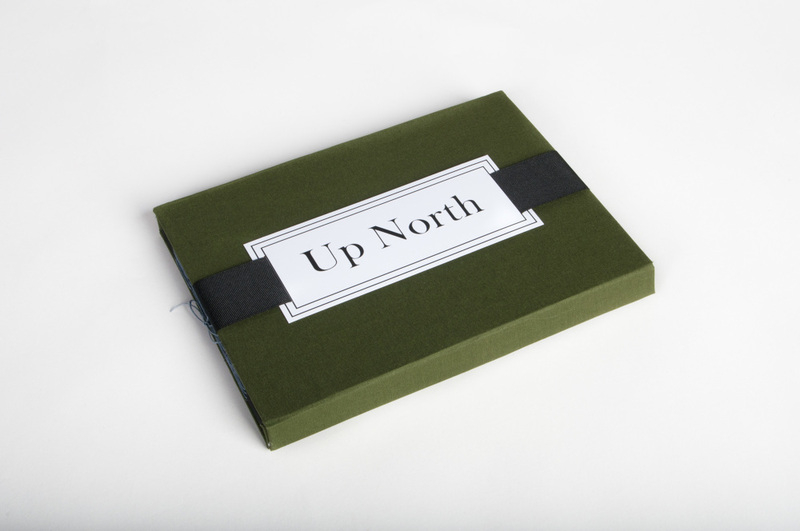 Up North is a photographic hand-made book that deals with the complexities of memory. Specifically, it highlights a moment that tends to be idealized: vacation. Many of us have memories of past vacations and places we return to on a regular basis. As someone who grew up in Michigan, my fellow “Michganders” and I can I agree, it was generally somewhere “up north.” This place, whether it was a campground, a cottage on the lake, or a cabin in the woods, is where we spent our vacation. Over time, generally, our memories become hazy, idealized moments that we reminisce upon year after year. Up North exercises memory with present and past, overlaying and repeated imagery. Each image acts as a memory, a trigger object, to bring the viewer to moment in time that they or someone else found special. The French door layout allows the viewer to review these images in multiple ways, which emphasizes how memory changes over time. The transparencies act as a reminder that new memories are created each time the place is revisited. Memory is not permanent. Each day, as new memories are created, old memories fade. Photography becomes a powerful tool to help recall these moments that are special. This piece expresses the idea that the past is brighter in the future. Reminiscing to a time that was “easier,” or carefree and is often referred to as the “good ol’ days.” The question is, were they really any easier or all that good? Humans tend to remember the good times, photograph them, and organize them in an album in hopes of making them permanent. Giving permanence to a bad situation or time is viewed as mentally unhealthy. Most family photo albums highlight accomplishments and mark milestones. Rarely do they show the hard times or the banal moments of everyday life. Our memories will fade and eventually the bad days will end up being forgotten and replaced with the good ol’days. Up North is a reminder that our memories are fragile. What once was so clear in our minds fades and becomes unclear as time goes on. Photographs are our ticket to the past. They help us remember the times that we once cherished.